It’s hard to go far in Vienna around Christmas and not get offered a Weihnachtskekse: a homemade Christmas biscuit. 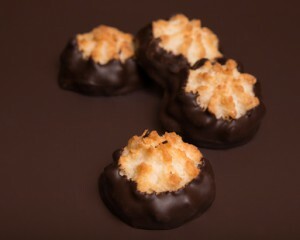 In fact, studies show the city actually sinks 2mm in December under the weight of almond squares and coconut macaroons. What distinguishes them from normal biscuits and cookies is both recipe and size. They’re small, so can be downed in one swift bite (regrettably), and many varieties only really appear in shops and kitchen ovens around Christmas. Baking the biscuits is a family tradition often involving the children – the young ones like to stamp out the shapes. Which also means most Kindergarten kids come home at some point bearing plates of misshapen baked dough you’re expected to fake pleasure at eating. I speak from bitter (literally) experience. However, every supermarket (and a lot of other stores) also sell packs of Christmas biscuits in all shapes and sizes. Tip: these packs make good gifts, especially since the variety of pack sizes mean you can spend as much or as little as you want. Vanillekipferl (vanilla crescents): this is by far the most popular variety. A dry biscuit following a simple “butter, flour and sugar” recipe. Mandelbällchen (almond balls – not a medical condition): made of sugar, egg whites and grated nuts. Kokosbusserl (coconut macaroon): usually covered in a chocolate base. Zimtsterne (cinnamon star): cinnamon is a popular spice around Christmas here, with cinnamon sticks also used as decorations. Star-formed biscuits come in many varieties – almond stars are another popular one. Linzer Augen (“Linz eyes”): a two-layered biscuit with a jam filling, often redcurrant or apricot. Ochsenaugen (jammy dodger): very similar to the UK branded biscuits with the strange ads. 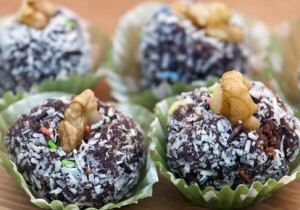 Rumkugeln (rum balls): for a little does of alcohol to chase away the gift-buying blues. Schoko-nuss-stangen (chocolate and nut sticks): um, a stick-shaped biscuit with, um, chocolate and, um, nuts. Linzerkipferl (Linz crescents): a miniature version of a year-round soft biscuit with ends dipped in chocolate. My favourite. Florentiner (Florentine): the Italian specialty. 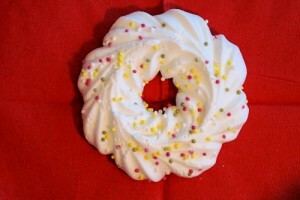 Windbäckerei (meringue biscuits): these are often baked as small rings and then hung up on the Christmas tree.